The concept of sharing public roads with the 840-horsepower 2018 Dodge Challenger SRT Demon is scary enough in itself. It’s even scarier—for anyone involved—to realize that some of those 840-HP Demons could get stuck on their cruise-control setting while out there. 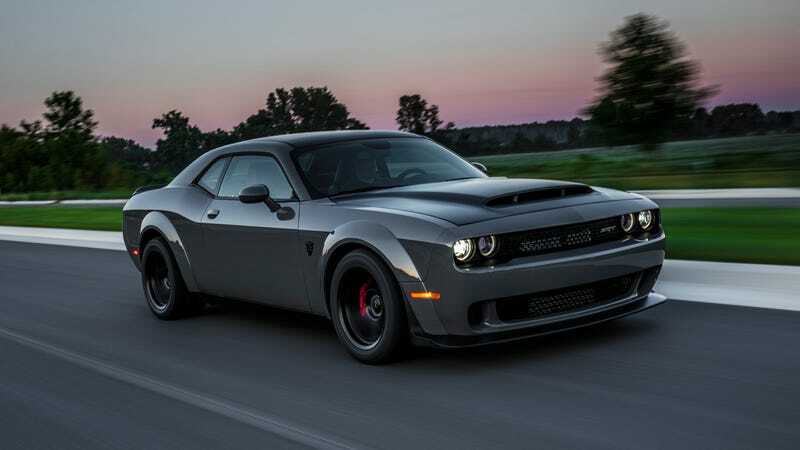 Fiat Chrysler recalled certain Demons earlier this month for issues with cruise control, along with certain Challengers, Chargers and Chrysler 300s with 5.7-liter engines and the $2,200 Mopar Stage 1 Kit Performance Package. There are about 1,930 cars in total included in the recall. If you’re a U.S. owner and want to check up on your car personally, paste its VIN number into the U.S. National Highway Traffic Safety Administration’s recall website. Then, actually go get your recall done if there is one. This new FCA recall showed up on the NHTSA website less than two months after FCA had to recall nearly 5 million other cars because cruise control might not turn off. That recall was all over the FCA lineup, with more than 15 Chrysler, Dodge, Jeep and Ram models included. The big recall from earlier this summer and this new one both have to do with software on the cars’ Powertrain Control Modules, which could make a driver unable to cancel cruise control. FCA said in both recalls that the cars might even speed up if they get stuck, but that drivers could overpower the cruise control by shifting into neutral and/or applying the brakes. In the extremely rare instance of a short in the vehicle causing the CAN-C bus to stop communicating while the cruise control is active and the vehicle speed is below the set speed such that the cruise control system is requesting positive torque at the exact moment of the electrical short, it is possible for a positive torque request to be locked on the PCM which may result in either the vehicle maintaining its current speed or possibly accelerating. If the driver does not shift to neutral or apply the brakes to stop the vehicle this condition can cause a vehicle crash without prior warning. The NHTSA recall paperwork said FCA will start notifying owners about the recall around Aug. 31, meaning a decent amount of people could drive around for another month without knowing anything is wrong. Do yourself a favor and check your car for recalls, even if it’s not included in any of this FCA stuff. It’s far more preferable to take a few minutes of your day to search a VIN number than it is to wind up freaking out on the street with some cruise-control problem or a fire under your car.